Thank you for all your support. Would not been able to solve this without your help! I have checked both switches. They seem to have a very similar function, so I don't think that the switch is fauly. Rather that the RB will not retract to te exact position needed. Pusing hard on the left part of the RB will make it go down 1/4 inch or so, and the switch will get contact. However, the RB will not stay in that position. But another thing, I noticed thet the spring inside the assembly doesn't seem to be compressed. I don't know how the pressure is supposed to be, but this is when the RB is in the bottom position and to me it doesnt sem to be enough to extract the RB quickly. Could it be that the RB can be movable up and down with the hydraulics, without engaging the spring? Johan.......Congratulations and give yourself a pat on the back. The A208 power roof system has numerous complexities and your troubleshooting, observant ongoing feedback and repair skills were top-notch! As typical in dealership repairs, the tech reads the STAR diagnostics and then starts replacing parts, without doing the required troubleshooting to determine the specific malfunctioning component. Long story short, your brother-inlaw already paid $1,500 for a repair that did not solve the problem and would have had to made numerous trips back to the dealership and spent a princely sum of money, changing all of the component possibilities that could cause the rear bow to not release. He did not need a new pump for $8,900 and because MB does not sell individual parts to repair the RB malfunctions, repair is via replacing the entire RB assembly plus labor would have been substantially more. Had you determined that the retract switch was defective, I could have provided you the part number where a genuine MB replacement could be purchased for 50 EU. Additionally, everything related to the hydraulics, can be rebuilt as new or better by Top Hydraulics, who has earned numerous forum, dealership and international rave reviews. Reference RB assembly description in post #219. That is most likely why the S83/5 RB retract switch was not being actuated. When the springs on both sides of the RB assembly are not equally compressed, the synchronization shaft (#30), could have a slight cant (e.g. If the spring on the side opposite the RB retract switch is compressed less than the spring on the opposite side, the cant would be slightly downward, which kept the switch from normally being actuated). In the event of a crash or critical driving situation, raising the RB is independent of the normal RB operation. Specifically, sensors in the vehicle suspension will tell the N52 controller to activate and unlock (#7) via the Y57/1 crash deployment solenoid, which will release the spring tension and instantaneously raise the RB. Last edited by Serndipity; 10-27-2018 at 10:34 PM. The car's been sitting since mid-January, battery was close to dead, a bit of moisture in the car. Jumped it, tried to lower the roof but after (a) releasing front bow lock (b) windows went down on their own (c) actuated the console switch and ... nada. The light in the console switch stays solid for a short while then starts flashing. I raised and lowered (several times) the rear headrests to be sure they were fully retracted; still nothing. I'm hearing a slight click from the rear when actuating the console switch, but without an assistant at hand I can't get to the rear to pinpoint where it's clicking (will do that later today). Sounds like the click of a relay. When I first got the car (mid-'15) the top was flaky, would sometimes raise/lower, sometimes not, and I'd isolated it to a relay somewhere in back, I think in the compartment where the top is stowed when down. Replacing the relay corrected the original problem. It sounds like the clicking is coming from that general area. Once the battery gets low beyond systems memory settings. It requires a reset. Especially the windows in the cab. Only relay in the rear is for hydraulic pump. A loud humming when working. Might be quieter with trim installed. My cab been sitting for a bit as well we'll see. If the pump is working a good manual open and close might get the system working again. Installed new battery (old one wouldn't hold a charge). Opened and closed the top and is so doing saw that switch s84/15 (part 2088202310) was not functioning properly: the part that slides and attaches to the end of the piston was nearly snapped, and the plastic that connects to the end of the piston was damaged (the tines of the fork were broken off so that it would no longer clip to the end of the piston). As I was manipulating the slider to see if I could get it to fit on the piston-end, it snapped. Just ordered a switch. That said, with the top up, releasing the front bow takes the windows down, but that's as far as it gets: console switch blinks (1hz). Rollbar warning lamp seems to be behaving normally (on with key is position 2, with engine running and headrests lowered, blinks ~15s, then goes off - this tells me the rollbar switch is OK, correct?). So would the s84/15 not being in the correct position(s) at the each stage during manual top up/down to "reset" the system be enough to prevent the top to proceed past stage 2 (windows down) to stage 3 (read bow lock released)? The chart (comment #213) that shows the the switch and solenoid states has for s84/15 that the switch is in "bow down" position. sounds like you nailed ot. Good detective work in the ee control sequence. Takes a lot of patience and understanding when working on the unknown. Let us know when the switch is is installed and top Happy. Be weary if there is linkage wear. Mark........good to hear that you found the information in post #213 the key for troubleshooting your power roof problem. Yes, the S84/15 'bow up/down' position switch must be activating properly for the controller to proceed to the next stage whenever opening or closing the power roof. The S84/15 switch as been a fairly common problem, with either the switch becoming unfastened from the cylinder's body or it's pull in/out extending arm, that actuates the switch, becoming unfastened to the end of the piston. 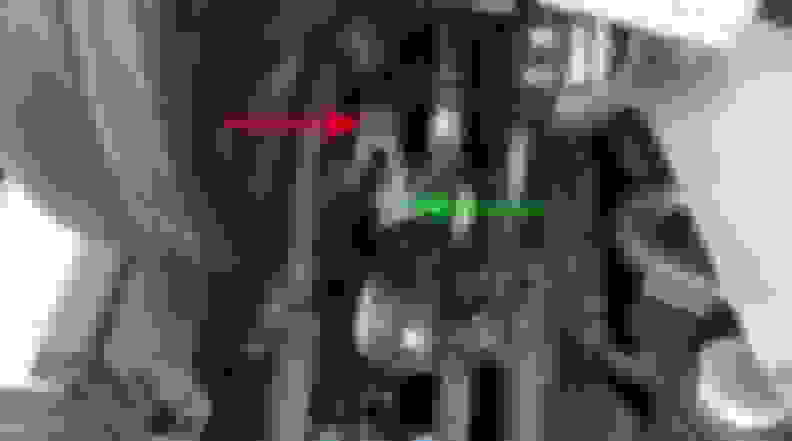 Usually the repair has only required refastening the clip (red arrow) to the end of the piston rod (green arrow). See https://mbworld.org/forums/clk-class...t-opening.html for more information. Last edited by Serndipity; 02-18-2019 at 05:43 PM. Alas, the clip wont clip anymore, though I would have found some other way to fasten it had I not snapped the sliding part (it was already fatigued). What I'm wondering is whether there are any circumstances where this switch's faulty reading would prevent it from moving from stage 2 (windows down) to stage 3 (bow lock released ... which it wont). I can see how the system might balk at doing anything if during a manual soft top "reset" it saw a limit switch with incorrect values at various stages. If so I'll hold tight until the switch is replaced. 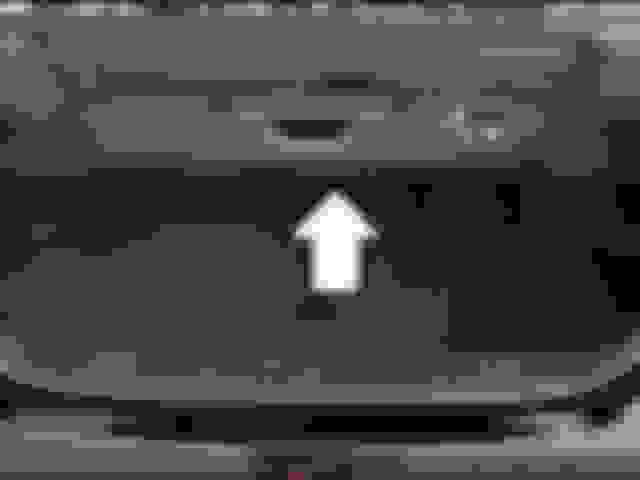 Or does it not care what the switch values were as the top was reset, and should either get to the start of stage 4 (rear bow released, bow down, but switch says "up", so it doesn't proceed through stage 4) or through stage 4 (rear bow actually up, but switch does not say "up" and so doesn't proceed go stage 5). If that's the case, and it should at least get through stage 3 (release bow lock), what next? I guess my question is whether the state of all the switches must be sane before it will do anything beyond stage 2. With Spring arrived and the incessant rain apparently at bay, I finally got around to swapping out the switch. I bought a used one on eBay - switch plus the cylinder - pried the old switch off the cylinder, pulled up the rear seat (bottom only), and found the connector behind the side panel. The "proper" way to do this is a lot more laborious, and rather than pull apart the rear interior in order to properly remove the old switch's wiring, I opted to feed the replacement switch's wire down to where it connected at the bottom of the side panel (using a length of stiff wire to help feed it down), and once accomplished, cut the old switch off its wiring and left the wiring behind. Popped the switch onto the cylinder, manually lowered the top, then with the ignition on, raised it by hand. Voila! Not quite. When lowering the top, it got to the point where rear bow was up and wouldn't proceed. It sounding like it was still trying to raise the bow. Manually opened the cover but by then it was confused again (blinking console switch). Went through the reset again, this time finishing with the top down. Again, this time on the way up, it would get to the point where the rear bow was up, still sounding like it was still trying to raise the bow. Flaky used switch? I had the old switch (in parts at this point) saw how it operated, and figured the new (used) switch was either faulty or sticky or the parts not fit together quite right, with the result being that when the rear bow was up, the micro-switch was getting actuated and the system stll trying to raise the bow further. I pulled the new switch off, made sure the arm that actuates the switch was properly in place, slid the slider in and out repeatedly to exercise the switch a few times, popped it back and, this time, Voila! I just purchased a the 2002 CLK55 and the convertible top is not opening or closing. I am trying to look at your thumbnails to aid diagnostics but the print is too small when I try to print them. I know this post is old so you may not be on here. If there is another way I can get them, please let me know. Thanks for the info!! 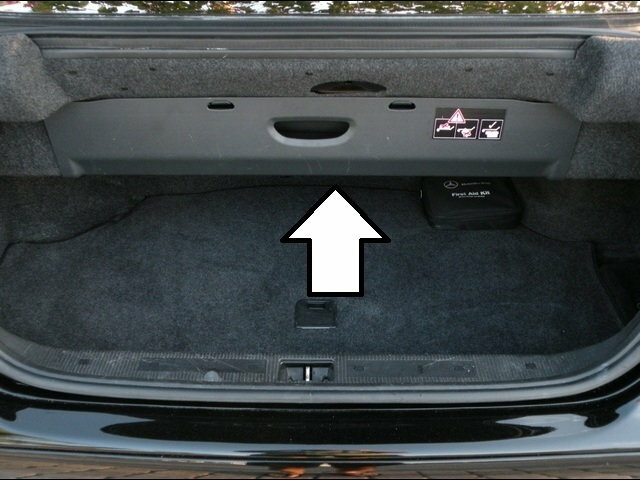 One quick thing you can check is to open the trunk and make sure the cover that protects the top when it is retracted is in the proper position. When it is in what I'm going to call the closed position it activates a switch that allows the top to function. If it's not in place the top will not work. I'm talking about the piece in the trunk I have the white arrow pointing at. Thanks for your quick reply! I did check this first but did not ohm the switch. However, I get the solid light on when latch released. I pull the top switch back and and I hear three quick click noises from pump area and then the slow blinking light. The roll bars do move up and down with the switch, so I know the pumps works. Swapped relays anyway but didn't help. Guess I am going to have to take to a shop and have codes read to see which switch is not letting it open. This thread has tons of useful info which I have been poring over the last couple of days. I had a CLK430 that got totaled and this is its replacement. Other than replacing a couple of leaking cylinders on the old one, I never had a problem with it. I think I am down to two switches and possibly a broken wire. I think I read that the bow lock switch and the soft top compartment switches are the only two switches which will cause the slow light when starting to open. Any advice is appreciated!! RICHAM70.........You should be able to correctly diagnose, troubleshoot and repair your power roof, just using the previously posted diagnostic information provided by the condition of the lamp in the main power roof switch and the stages of roof operation. IMHO, is superior to getting the roof's DTC codes, which typically just indicate that a position/limit switch condition is implausible, the time for an actuation to occur haqs timed out etc.. The key is in reading and interrupting those 2 documents carefully. As example, when the roof is properly closed and locked, there are 3 position switches that must be actuated, so it's important to analyze what the lamp in the main switch is telling you (e.g. based on not only when it occurs, but whether the switch is being pressed, or not). The 3rd switch is actuated manually when you lock the roof's front bow. However, in stage 2, if your windows and roll bar lower lower, if they were previously raised, that switch is operating properly. All of the switch actuations that are required for a particular stage of roof operation to occur and proceed, can be determined with just a multi-meter (set to measure ohms) at the controller connector (which also verifies that there is not a wiring issue and that their actuation's are in sequence with the controller's programing) . Also note, as noted in post #217, the change in your MY 2002 soft top cover switch. Hi! Thanks for the help! I figured it out. The wires to the rear bow lock switch were broken in the insulation at the hinge. I read this has happened before. An easy test to verify if this switch is the problem is to manually unlock the rear bow and then partially latch it closed. operate the power top switch on console to close top. If it pulls down the rear bow and latches then your problem is in the rear bow switch or wiring. Thanks to everyone for all the posted threads and fixes listed in this posting. The switch position per stage is invaluable.!! Oh, now how to splice in a new section of what appears to be 24 gauge wire or smaller. I'm thinking solder?! Well. thought I had it fixed. Ended up taking it to have codes read and diagnosed. Turns out control module is bad. Is the top module for a 2001 CLK430 and a CLK55 the same part number and/or compatible? The power roof system is independent of engine size. However, during 2001 calendar year production, the power roof system received numerous upgrades. As example, as of May 1, 2001, the former soft top compartment cover switch was changed from 2 circuits to only 1, and as of June 1, 2001, the pump assembly only used 5 solenoids vs. the 7 in prior . As as result, early and later production controllers would likely not be compatible and verification of the correct controller should be verified by the original part number and/or your VIN number. When pulling MB body DTC's, make sure that STAR SDS system was up to update and your VIN was entered. What were your specific DTC's ? The DTC's are somewhat general (e.g. status of a limit switch is not plausible. the time for an actuation to occur has been exceeded etc. ), upon which additional troubleshooting is typically required to determine the cause. As example, a B1000 DTC, indicates the possible cause to be a faulty N52 soft top controller, which could also just be a voltage supply issue with one of the three circuits that powers the controller. Thanks for replying. I have not gone to pick up the car yet so not sure on codes. I still have my CLK430 so I am going to pull the rear cover and check number of solenoids and part number. The 430 was a 2001 but not sure production date. I did check the 3 power circuits earlier with the connector unplugged and was good. Ohmed switches and checked voltages on applicable pins at applicable stages on N52 connector and all was ok. Had me stumped so I took it somewhere. He said it was a tough one too but that it needed a controller.